Two weeks in Nepal, two days of travel over 7,000 miles - I am happy to be home in San Francisco. As an outdoor enthusiast, I resonated with a quote from Lonely Planet's Nepal guide "while you first come to Nepal for the mountains, you return here for the people". I most certainly will be returning to Nepal for the people and I just might squeeze in a trek next time. Exploring Nepal is not for the delicate traveler. The smog can do a number on the lungs, you need tissues for the encounter with the porcelain hole in the ground and you might be challenged with a stomach bug here and there. The flights aren't cheap and it takes a very long time to get there. Due to political challenges, India has placed a blockade on fuel coming into Nepal. This meant no heat in some of our hotels but for Nepalis it impacts their daily lives for cooking, heat and transport with outrageous lines at gas stations. We resorted to buying fuel on the black market, which can be up to three times the normal price. I had the added adventure of losing my luggage early in the trip. We literally watched it fly off the roof of the van while we in it. We turned around within minutes and it was scooped up by someone likely dealing with the economic hardship of post earthquake Nepal. I got a lesson in letting go and in return, I received a stylish wardrobe from my new friends. I have never been surrounded by more productive people committed to improving the lives of others. As health care providers we often reap the benefits of feeling the impact we have with patients. Now imagine that ten fold. When I mentioned to Cornelia, the founder of Anatta that I climbed the Inca Trail to Machu Picchu, she had also done that but only after building toilets for the indigenous people. So it should be no surprise to me that in addition to working full time as a neuropsychologist, sometimes talking to patients during an awake craniotomy, she created a non-profit called Anatta World Health and Education Outreach. Anatta is like an octopus with tentacles reaching out and sending love to the people of Nepal. When Cornelia's team at Anatta partners up with Bodhi Sakyadhita's team at CEBA and Venerable Metteyya, they are a serious force to be reckoned with. A monk usually lives a peaceful life meditating in a monastery supported by the community. Ven. Metteyya is part monk, part super hero. With a soft spoken voice, a smile as wide as Nepal and a gentle disposition, he ingratiates everyone he encounters. This dynamic trio is committed to improving the lives of the people of Nepal, with a strong emphasis on health and education. Many children complete school at grade 6 in Nepal. Traditional Nepal culture does not value education for girls, leaving few opportunities for girls, in which they are arranged to marry young while others are bought into human trafficking or prostitution. Through Anatta, these children have the opportunity to go to college. This year, four young women will graduate as auxiliary Nurse Midwives. I had the honor to work with them and share stories of preeclampsia, hemorrhage and c-sections. I told them of a trend in San Francisco in which women eat the placenta and they shared that some villagers put cow dung on their babies umbilical cords - something they are educating the villagers to change and hopefully improve infant mortality. In addition to the medical and dental clinic, CEBA sponsored a vet clinic and treated local street animals. We also had the opportunity to see the continued efforts of earthquake relief through Global Karuna during the catastrophic earthquake last April, which killed over 8,000 people. I learned how complicated rescue efforts were due to red tape created by the Nepali government, the UN and so called disaster relief experts as they debated over who would win the contract - all while people were dying under rubble. While the quake was nine months ago, the rescue efforts are far from over. As a Westerner, we thought we were troopers wearing our wool hats to bed and snuggling up with a hot water bottle. An unheated hotel is quite a bit warmer than living on the side of the road in a tent village. There is much more work needed to be done and we can be part of that solution. Come join Anatta next year, make deep friendships and cry all the way home! This week I flew to NY for a friends wedding. I coordinated the rental house for myself and five friends, bought a dress, packed efficiently to avoid checking a bag and booked my flight. Or so I thought! I missed one important detail. As I embarked on my journey to the NY wedding, it dawned on me on the way to the airport, that I never received the automated check-in for my flight 24 hours prior to departure. This was immediately followed by a surge of adrenaline and pit in my stomach. I searched my email and attempted to check in online, only to find the message: “You have no upcoming flights”. This was followed by a stronger surge of adrenaline. To my surprise, I never actually booked the ticket. I fly at least six times a year and have my system down. I booked three tickets that day and obviously got sidetracked along the way. This so called efficient process was thrown off by a series of distractions. We can’t always be in a state of balance or be mindful 24/7. However, we have a choice how we meet our moments of self-created chaos. We can choose to activate that inner critical voice and berate ourselves or we can find the humor in the situation and meet it with self-compassion. I chose the latter. Remaining calm, I searched discounted web fares (there were none to be found), walked into the airport and bought a ticket at the counter. While I twinged paying twice the price of the original fare, I celebrated my goof over a bloody mary and called a friend to share this hilarious story. Later that day, I discovered that two people in my house-share miscommunicated and arrived at different airports, which made their car rental share a bit challenging. Like me, they didn’t waste anytime in blame or judgment. They found a way to see the humor in it and subsequently problem-solved their way to a solution. When you goof up, which pattern do you fall into? Conference time! We don't know what we don't know. I spent the past week in San Diego at NTI, a nursing conference put on by The American Association of Critical-Care Nurses. I was inspired and renewed surrounded by 8,000 nurses attending the conference. The speakers were dynamic and presented topics ranging from pharmacology, sepsis and evidenced based practices to health care reform and healthy work environments. I was joined by a coworker and met some former colleagues. The hardest job I ever loved was working in the Intensive Care Unit of Memorial Sloan-Kettering Cancer Center in New York City. The staff was incredibly cohesive, supportive, professional and on top of their game. I left that position to move out West as a traveling nurse. Who would have guessed that Tamiesha, a traveling nurse from Baltimore put down roots in the very same unit at Sloan-Kettering and introduced herself to me at happy hour? Although we never worked along side each other, I felt a camaraderie with her as if we were from the same family of sorts. We had so much fun comparing notes on the cast of characters and our paths of our careers. I also had the opportunity to connect with people who I had previously only known through social media, such as Katie Kleber from Nurse Eye Roll. Did you know that 30% of new nurses leave their job within the first year? That was one of many interesting factoids I learned in San Diego. 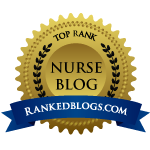 Katie has done a great job supporting new nurses with her blog and her book Becoming Nursey. Stay tuned for a future post with my interview with Nurse Eye Roll. This coming week I will be attending a High Risk-Obstetric Conference conveniently located in San Francisco. I’m looking forward to spending time with my coworkers and immersing myself in my specialty. If you have never been to a conference, I would encourage you to put one on your calendar this year or next year. I’ve been to NTI through AACN, ONS (oncology), AANN (neuro), Medical-Surgical Nursing Conference in San Francisco and Symposia Medicus. Ask your clinical nurse specialist for a recommendation or rally your coworkers to join you. It can light a spark if you are feeling a little stale or burned out. It also allows you the opportunity to compare your protocols with hospitals across the country, see new trends and you might even be inspired to do a poster presentation or speak at a breakout session. Someone told me they got a new job while waiting in line for the ladies room! So if your resume can’t progress beyond the recruiter, pack up some resumes and check out a nursing conference. Allison was born, raised and trained as a nurse in Australia. She has been a nurse for 27 years, and has worked in The United States for over 10 years, primarily in ICU. She and her husband Paul (also a nurse) became traveling nurses, fell in love with NYC and are enjoying the States while waiting for the job market to improve in Australia before heading back home. What were some challenges you faced transitioning into a foreign nursing system? I was terrified I was going to get sued – since The US medical system has such a litigious reputation compared to home. I came from a Neurological Trauma ICU in Australia so it was a difficult transition to clinical practice; I was allowed to do things here that I wasn't allowed to do at home and things I was not allowed to do here were done by floor nurses at home. We didn't have aides/therapists so I found it hard to let anybody touch my patient here. I felt like I was translating everything in my head, I really grew an appreciation for nurses who came to English speaking countries when English was not their native language. I become a walking thesaurus; I had to have at least 5 words for everything I said with my Aussie accent since “speaking Australian” was such a challenge for Americans. Tell me your biggest pet peeves about Nursing. Not enough time to do nursing. Staffing ratio's and paperwork takes away our clinical time. We spend so much time filling out forms saying what we are doing, we don't actually get the time to do it. What do you love most about nursing? What's not to love about nursing? I get to have the best job in the world that encompasses so many other jobs: therapist, teacher, student, mentor/motivator, healer, communicator, diplomat, and the list goes on. If I had to pick one thing I loved most, it would be the people I have met both in and by the bedside. What throws you off balance about working as a nurse? What brings you back into balance? I check myself. I now know I set high expectations for myself and everyone around me, which is not always achievable. So I take a breath and set both a mental and written checklist (I love a good checklist). I check one thing off at a time and accept this is the best I can do at this time and place. If everyone is annoying me, I take a day for myself to do whatever I want, sometimes its just laying in my pajamas doing nothing. We give so much in our profession; we find it hard to give back to ourselves in the same manner. I'm trying to be more selfish; it’s a work in progress. Tell me a funny story about work. I was working in the SICU at John's Hopkins. I received my patient from the ED with a gun trauma to the face. I’ve always said the ABC's of nursing are Appearance (the patient looks, clean and tidy), Bed space (the bed space is stocked with everything I need for whatever situation might arise) and Curtains (curtains tied back neat and tidy). She was and African American woman with these beautiful braids but they were saturated in blood. (We don’t get many African American patients with braids in Australia). I carefully proceeded to undo the braids and thoroughly washed her hair. I discovered the braids were woven into her hair and I was left with this unruly mess for the proceeding weeks in the hospital. Lesson learned don't touch the braids. What advice would you give to new grads starting out? Be proud of your mistakes, you're going to make them. Own them and learn something from them, share them with others so they can learn. A lecturer once told me 'the more you know, the more you realize you don't know'. Be kind - To yourself and your fellow nurses. Don’t be too picky about what you want to do. All experience is a learning experience that can help you get to where you want to go.